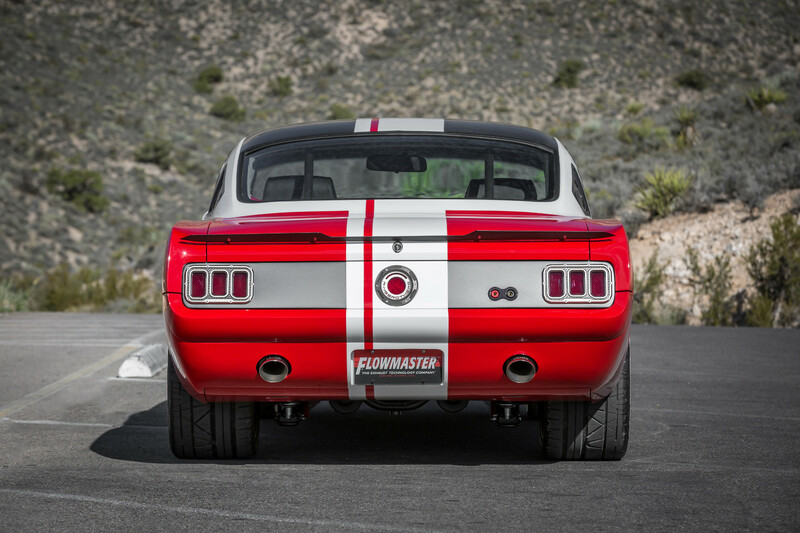 Rehashing old classics is all in a day’s work for custom shop “Ringbrothers,” founded by Mike and Jim Ring. 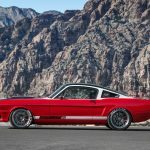 However, the build they’ve just revealed at this year’s Specialty Equipment Market Association show in Las Vegas is a tad different from their usual fare; the 1965 Ford Mustang “SPLITR” build was conceived of by someone else. 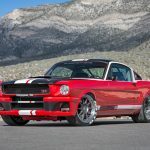 The Ringbrothers shop was approached by a graphic designer, who showed the two brothers the renderings for his “dream car.” Ordinarily, the two originate each one of their custom builds themselves, but this reimagining of the 1965 Ford Mustang was different. The Ringbrothers SPLITR build started with the rocker panels, oddly enough, which have been extended through the original front fenders to meet the wheel arches. They’ve also been extended downward by 1.5 inches and integrated into a new, flat undertray. 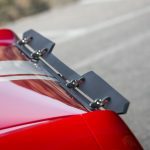 That undertray, conducive to improved aerodynamic performance, also extends to the rear of the car where the fuel cell hides. 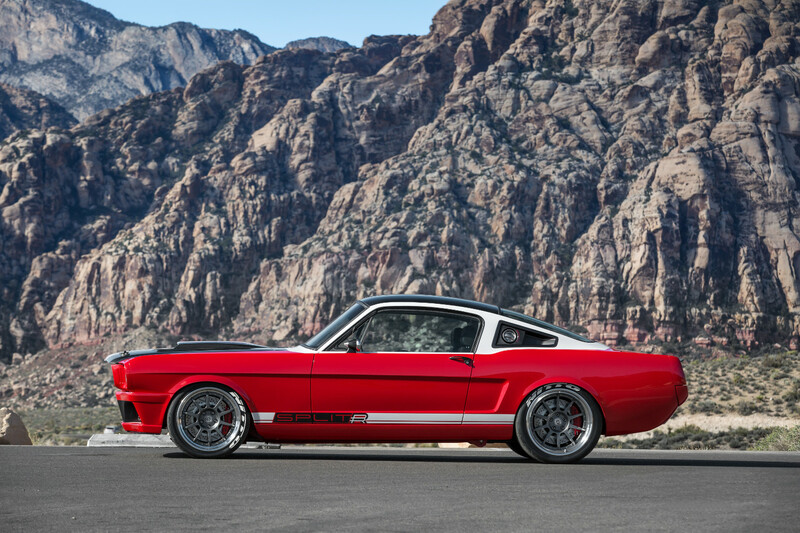 Up top, Ringbrothers has replaced the hood on this 1965 Ford Mustang with a carbon fiber fabrication. 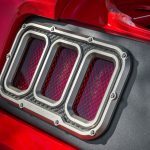 The engine bay has been enlarged to accept a massive, 427-cubic-inch V8 furnished by Ford Racing, fed by a custom Ringbrothers airbox made of aluminum with a Lexan window allowing showgoers to peer into the throttle body. 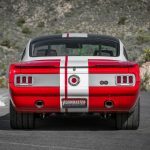 The engine is coupled to a Bowler-built Tremec 6-speed manual, and exhaust gasses are expelled through a pair of Ringbrothers headers and custom plumbing with dual Flowmaster Supper 44 mufflers. 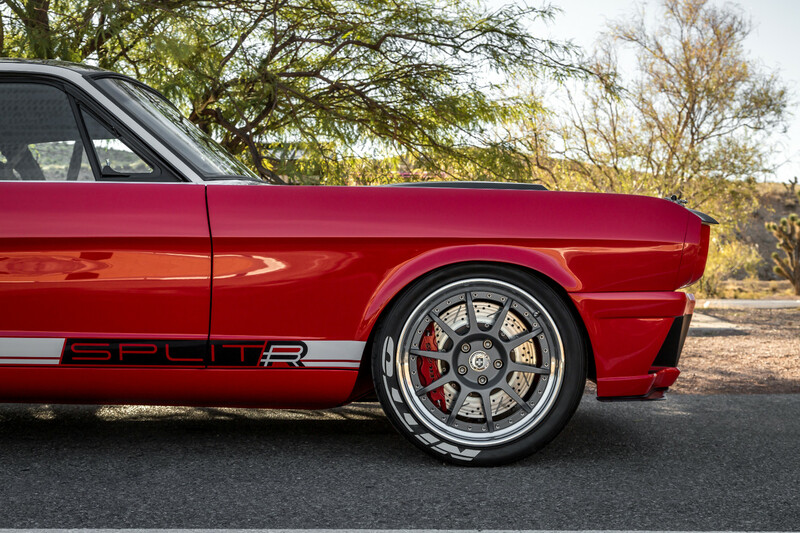 On the topic of ride and handling, the Ringbrothers 1965 Ford Mustang SPLITR utilizes a Detroit Speed Engineering “AlumaFrame” front suspension system. That constitutes of a cast aluminum cradle, custom-tuned steering rack, tubular suspension arms, and adjustable JRI coilovers. 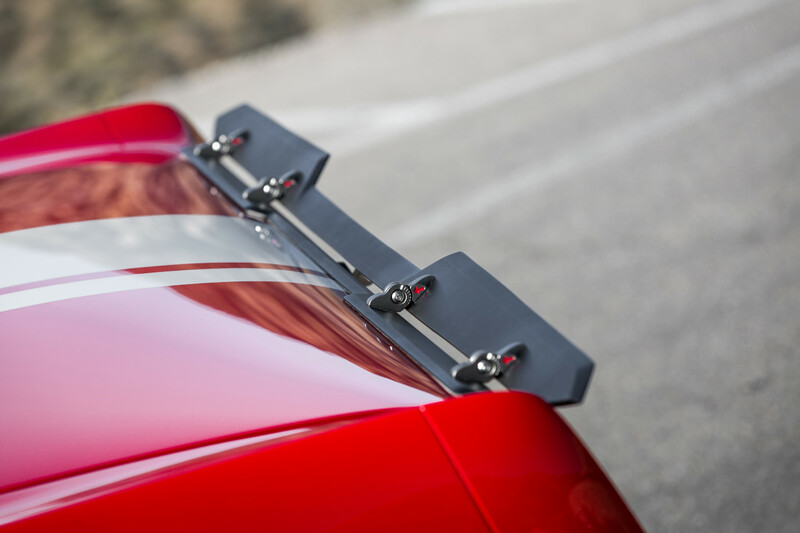 The rear also uses JRI adjustable coilovers, and takes advantage of DSE’s “QuadraLink” suspension system. 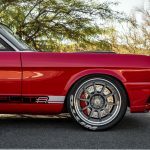 The SPLITR rides on HRE forged wheels, 18-inch front and 19-inch rear, and massive Baer brakes in all four corners provide the stopping power. 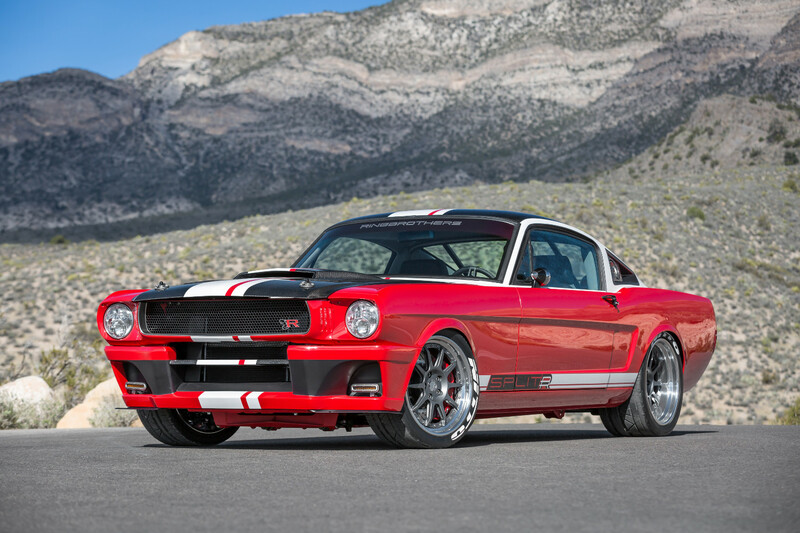 The new, resto-modified 1965 Ford Mustang SPLITR by Ringbrothers is a fantastically unique machine from a truly legendary custom shop. 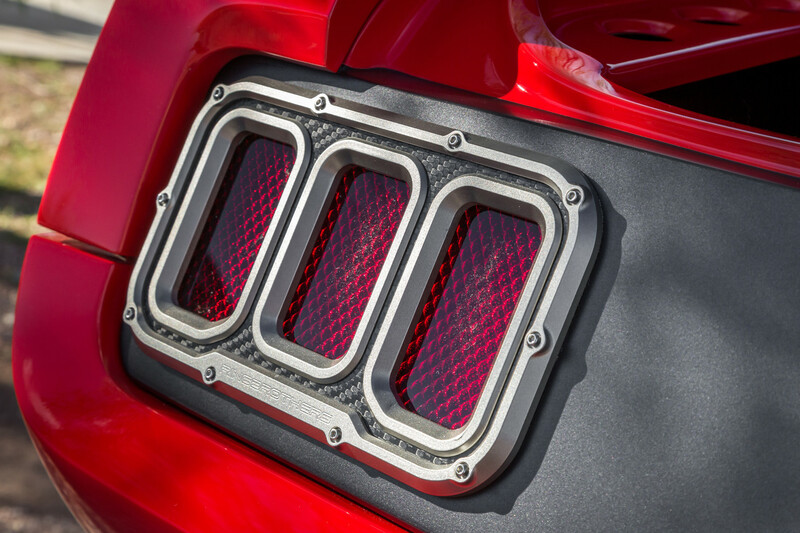 To see images of this special custom car for yourself, be sure to check out the gallery below.